Guard Kerwin Roach scored a game-high 19 points to lead the Longhorns' offense, but the Texas men's basketball team fell at No. 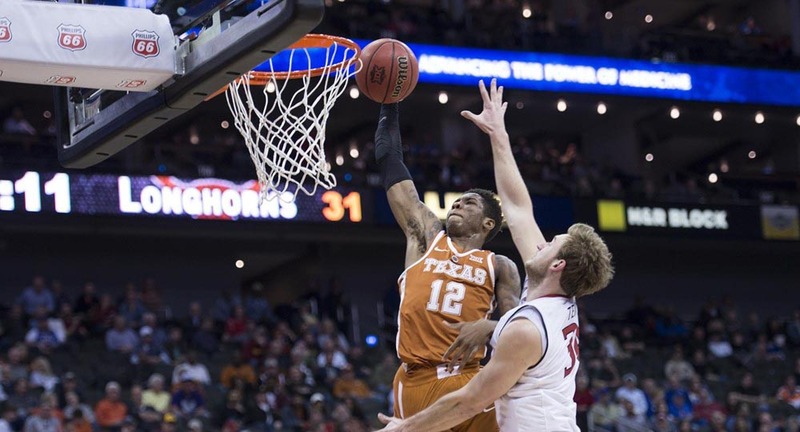 20/20 Iowa State, 65-60 (photo courtesy of texassports.com). AMES, Iowa — Guard Kerwin Roach scored in double figures for the 17th time this season and 63rd time in his career, but his game-high 19 points were not enough to lead the Texas men’s basketball team past Iowa State at the Hilton Coliseum Saturday. The No. 20/20 Cyclones had four players score in double figures, led by Talen Horton-Tucker’s 15, en route to a 65-60 victory over the Longhorns. With the loss, UT fell to 12-10 overall, and 4-5 against Big 12 opponents; Iowa State improved to 17-5 overall, and 6-3 in conference games. The five Texas losses against Big 12 opponents have come by a total of 20 points. The loss narrowed the Longhorns’ lead in the all-time series against Iowa State to 22-17, and ended a four-game win streak against ISU. Texas has struggled in close games this year, falling Saturday to 4-8 in games decided by six or fewer points. In addition to Roach’s 19 points, Texas got double-figure scoring efforts from guard Matt Coleman, who had 13 points, and forward Jaxson Hayes, who hit all four of his field goals on his way to 10 points. With his 19 points, Roach bypassed two former Longhorns on the program’s all-time scoring list. He now has 1,250 points in his career, leapfrogging over D.J. Augustin and Javan Felix to move into 21st place in team history. UT was effective on the defensive end, limiting the Cyclones to nearly 15 points below their season average of 79.6 points per game. ISU shot 42.6 percent from the floor, compared to a season average coming into the game of 48.6 percent. Texas also continued its improved shooting from the free throw line. Including Saturday’s game, they are shooting 70.7 percent from the line, but by converting 10 of 11 from the charity stripe, they cleared the 90 percent mark for the second straight game. The Longhorns return home to Austin to host Baylor at 7 p.m. Wednesday, Feb. 6 at the Frank Erwin Center in a game that will be broadcast on the Longhorn Network.